Where there is wealth there are also enviers. Particularly the important salt trade routes in present-day SalzburgerLand had to be fortified and defended since the Early Middle Ages (and partly even long before that). The imposing castles and palaces extending from the City of Salzburg as far as the Lungau region are the impressive evidence of earlier times. 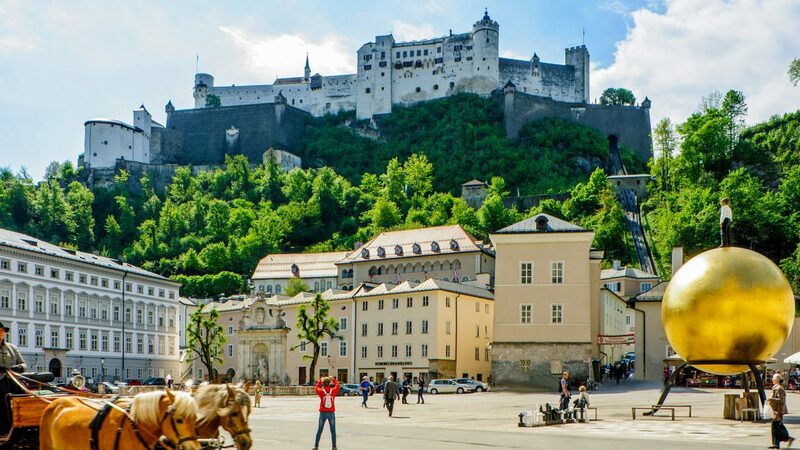 The largest completely preserved castle in Europe is visible from a great distance and greets anyone who approaches Salzburg. It safeguarded the wealth and sovereignty of the Salzburg princes and archbishops over many centuries, and was not captured a single time by foreign troops. Even while walking up to the Hohensalzburg fortress or riding with the fortress funicular (Verlinken auf Bahnen & Schiffe) you get a good impression of the might of this huge complex. A guided tour through the staterooms, chapels, armouries and museums is definitely worthwhile. In addition, a view over the city and the mountains takes your breath away. After that you can get the same view best of all on the sun terrace of the restaurant. The legend of the bull washers have given the citizens of Salzburg a nice byname. Salzburg was besieged during the peasant uprisings. Food was scarce and the last bull was the salvation: it was led over the walls with a hide that was painted different every day. The bull washers had to clean the bull again in the evening and prepare it with a new pattern for the next day. The besiegers were so deceived that Salzburg would still have huge resources and they withdrew without having achieved anything. Anyone who has ever seen Hohenwerfen Castle will never forget it. This is exactly how a child imagines a knight’s castle. But in reality it is even a bit more beautiful: located in the valley of the Salzach River, surrounded by rock faces and situated on a hill above the river, it is noticeable how one could control the Salzach trade routes from there. Hohenwerfen Castle (also known as “adventure castle”) is in excellent condition and revives the era of the Middle Ages. Yet in addition to that, numerous concerts and festivals are also held there, primarily in the summer. But falconry is the highlight of Hohenwerfen Castle. In former times the castle served as a hunting lodge for the archbishops of Salzburg. Birds of prey are trained here and presented at flight displays to this day. Klammstein Castle guarded the entrance to Gastein Valley for over 800 years. It was built by the counts of Goldegg, who were entrusted with the administration of Gastein Valley by the archbishops of Salzburg. The ore deposits found near Gastein made the valley an important economic factor for the archbishops. Everything that was of political or economic importance was transacted in the castle well into the 16th century. Responsibilities were reorganised in the following centuries, and the castle fell into disrepair by the 20th century. Gastein mainly owes the fact that Klammstein Castle can be experienced today in its earlier form to a single man: Adolf Ferner bought the grounds, rebuilt the dilapidated ruins and established a museum that revives the history of the region and its castle. But the castle tavern with the terrace is also worth a stop without a museum visit. Klammstein Castle is open daily from 11 am, Tuesday to Sunday. The castle from the 12th century was a legal venue and administrative centre for a long time. The most varying seminars and conferences are held here today. The so-called Goldegg Dialogues and the Painting Academy are particularly worthwhile venues in this connection. The Pongau Museum of Local History and a café are also located in Goldegg Castle. The SalzburgerLand Card is valid in all castles & palaces in SalzburgerLand. You can order it directly online.